My husband and I always enjoyed the holidays with the children. We would make a big splash about everything. I don’t think any of them escaped our special brand of idiocy. We felt it was important they enjoyed these times during their youth and tried to provide them with happy memories. New Year’s I would cook cabbage and corn beef, a more traditional northern meal. Other times I would cook the southern version, collard greens, hop-n-john with rice and cornbread. Many times, I would be grateful my mother-in-law did it for me. Valentine’s day always came with a Happy Bag filled with little gifts and a box of candy. Even though they were not our sweethearts, we loved them and wanted them to know our children were important in our lives. I remember setting up flowers to be delivered at school a few times to make them feel special. St. Patrick’s Day was full of pinches for no green and another helping of cab-bage and corn beef. I always regretted I didn’t make them green eggs and ham on that day. That would have been fun. Easter was always a big holiday for us. They had over-sized baskets. When they were smaller, these baskets were so big; they themselves could not carry them. As they got older, they had to be carried with both hands. We loaded them down with candy, gifts, & money. We have made several of these large baskets, filled to the rim, for other more unfortunate children over the years. They've all really enjoyed them. It was equally important for us to teach our children the art of sharing, compassion, and thankfulness of having people in our lives. I really enjoyed the Easter Egg Hunts. At first, my husband would get up early and hide the eggs. Some of them were plastic eggs filled with Jelly Beans (Al-ways Jelly Bellies, never the regular jelly beans), M&M’s, and special eggs had quarters. Their friends and family were invited over for hunts with anywhere from 100-200 eggs hidden around the yard. We eventually had to wait until all of the kids (friends and family) were inside the house, occupy them so they didn’t notice when my husband would slip outside and then hide the eggs. The 4th of July always came in with a bang. We had BBQ’s or cook-outs and again, we allowed them to invite their friends over if they were so inclined. We’d spend $300-400 on fireworks each year and set them off. Halloween was always fun. I’d dress up like a cow and go to their schools and deliver cookies or cupcakes - maybe I’d make trick or treat bags up for their class mates. Whatever the case was, it was always fun. After which I’d go home and decorate the house with Halloween dressings, spider webs, and my “thing box.” I had a special box made so that every year, the children who trick or treated at the house would get a "handful" of candy passed out to them by Thing. He’s the hand that was on The Addam’s Family cartoon and movies. Thanksgiving was another big holiday event - I cooked a lavish meal and eve-ryone and anyone was invited. I’d have both ham and turkey with lots of side dishes and trimmings. I tried to instill in my children that Thanksgiving is not just for family but a time to be grateful for all of the people in your life. As “hospitable” as the south is known to be, surprisingly this is not the view of many southerners. Christmas was even bigger. My husband and I adopted a family every year, even members of our own family. We'd provided them with gifts and some-times food and treats. Again, this was to teach the children about giving and not just receiving. For our children though, we would have gifts laid out under the tree, in the tree, and in their stockings. We had to use “Santa paper” and then there was regular paper. When my daughter was three, she pointed out that Santa used the same paper as we did. So any gift we exchanged with each other or other family members was wrapped in a fun and whimsical paper like Christmas Bears, Santa Claus, toy trains (I didn’t like the serious paper with poinsettias or trumpets). The paper Santa used was Disney paper or cartoon paper designed with Scooby-Doo or Bugs Bunny - along those lines. Birthdays were another big event. We always felt the children were sent to us by God and we should rejoice that we could be so blessed as to have them. We’d have parties at McDonalds, Discovery Zone, Chucky Cheese - wherever they wanted to go - they had gifts to open, cake to eat and all the festivities. When they got older we started taking their friends to eat at whatever restau-rant they choose and then off to a movie of their choice. Even our wedding anniversary did not escape the dinner and movie theme. We had the children tag along with us in celebration because again, we felt they were a gift from God. They were very much an important part of our marriage, our relationship, and should not be shunned in the celebration. 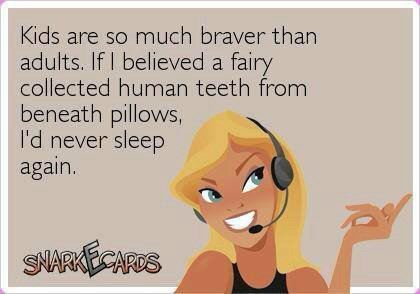 The Tooth Fairy always got slighted, with emphasis on “always.” I can only shake my head. My daughter would patiently wait weeks and weeks for the Tooth Fairy to come. If she came early enough, my daughter would get a cou-ple of dollars. I distinctly remember one time it took that nutty fairy a month to show up! I know I left perfect instructions to the house! My daughter didn’t mind though. She scored $20 that night. When my son came along, all of our “traditions” were in place and he just reaped the benefits of each celebration. Our daughter really was our trial and error baby. The only thing we had to alter were the name tags on the Christ-mas presents. He had discovered Santa had the same handwriting as Daddy did so, I had to come up with some funky way of writing their names. When he started losing his teeth she took her little brother aside and ex-plained the process to him. I overheard her explaining “interest” to him.